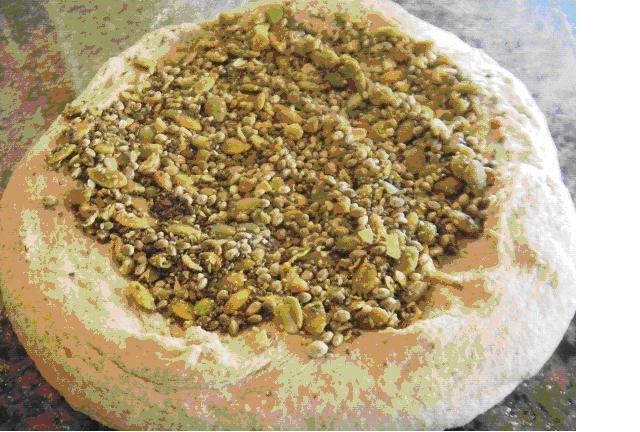 Twisted Sisters Chacon : 67% Whole Rye & Wheat with Sprouts & Seeds. After the last white bread bake using the Pharaoh’s Mastaba, we went back to a 67% whole grain; rye and wheat bread with rye and wheat sprouts and a variety of add-ins and seeds including wheat germ, flax, coriander, pumpkin, hemp, rosemary, chia, cumin and red rye malt baked in another variation of the Chacon. The Chacon is quickly becoming a favorite bread shaping method. 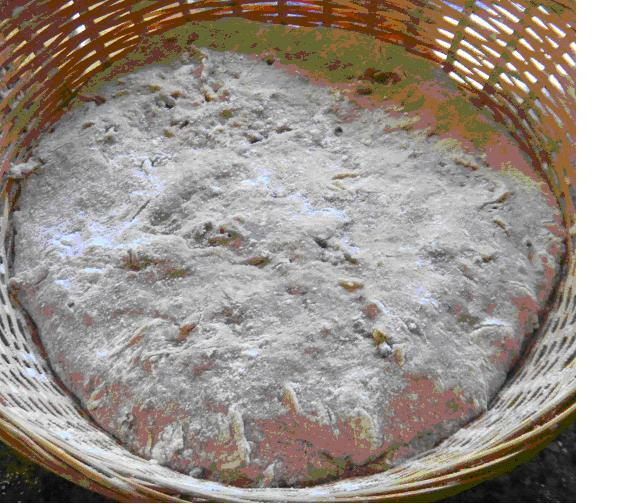 It is a fun way to make bread with as many variations as one can conjure up and imagine. This time we used a plain knotted roll in the middle of the basket and surrounded it with a plain two strand braid that was twisted (Twisted Sisters). Then we added the remainder of the dough which contained all the add ins and sprouts as a disk to the top – which will become the bottom when tipped put of the basket. This gave us a new but handsome boule shape that had no add-ins in the finish top and all the add-ins on the bottom. It will be like having two different breads in each slice. The Chacon came out of the basket easily and it slid into the mini oven, without slashing, just as well and onto my new ceramic tile / stone - which quickly broke when we threw water onit by accident before closing the door to steam. No worries, the tile only cost 88 cents and I have 11 more of them. In the back of the mini, we used Sylvia’s steaming method with a Pyrex 1 cup measure half full of water with dish rag in it. The stone worked well and the Chacon was very brown and crunchy when it came out of the oven and it smelled wonderful too. The boule cracked at each twist of the sister and at the knot seams. We just love the way the Chacon cracks almost exactly where we want it to and think it should instead of willy nilly. The crumb shots and tasting will follow after the Chaon cools. The formula and method follow the pix’s. The method was similar to our recent bakes with (3) - 4 hours each, 12 hour SD levain build. This time it was not retarded overnight because we used some sliced onion in the build that made it smell more sour than normal. The flours were autolysed with the wet and salt for 12 hours in the fridge too. We have been adding the salt in with the autolyse recently and cannot tell any difference when we do it this way. Forgetting to add the salt days are now over. After soaking in water for 4 hours, we placed the seeds to be sprouted on 2 damp paper towels covered with another and wrapped in plastic on a plastic cutting board. Half way through the 24 hour sprouting period, we re-dampened the top towel and covered it back up. The seeds were sprouted in 24 hours. We mixed the dough with the autolyse with the KA for 8 minutes on 2 and 2 minutes more on KA3. The dough was then moved to an oiled, plastic covered bowl to rest for 15 minutes before doing 5 sets of S&F’s every 15 minutes on a floured work surface. When the S&F’s were complete the dough was left to develop and ferment for 1 ½ hours before going into the fridge overnight for 8 hours. In the morning the dough was allowed to come to room temperature over 1 ½ hours on the counter. 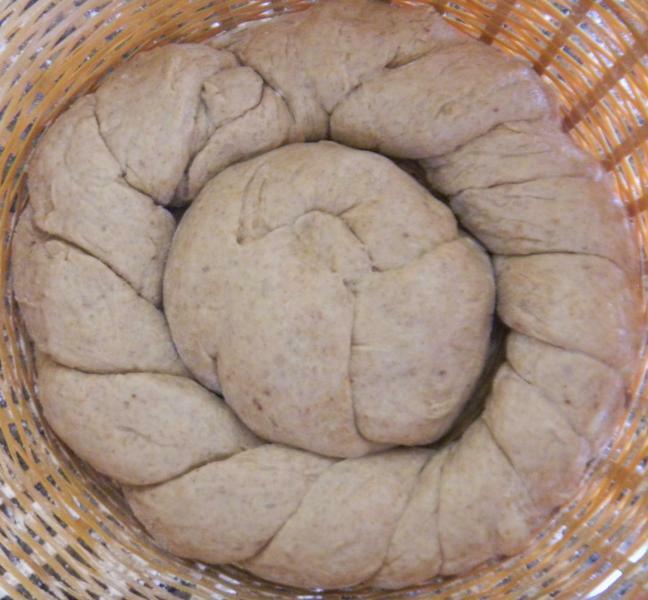 The dough was then portioned into (3) 150 g pieces for the knotted roll and the 2 strand, ‘twisted sister’ braid. In a rice floured basket the knotted roll went in first in the center, then the twisted sister went in around the knotted roll. The remainder of the dough was flattened out gently and all the sprouts and add ins were incorporated. Once the add ins were incorporated evenly, the remaining dough was shaped into a boule and allowed to rest for about 5 minutes until it had relaxed. It was then flattened into a disk the width of the basket and placed on top of the roll and braid to make the finished Chacon in 3 distinct sections. After a 2 hour proof it had passed the poke test and was ready for the mini oven stone and 12 minutes of steaming at 450 F regular bake. The steam was then removed and the mini oven turned down to 425 F convection this time. The Chacon was rotated 90 degrees every 5 minutes. After the 2nd rotation the oven was turned down to 400 F convection. 20 minutes after the steam was removed, the bread was done – 32 minutes total. It was allowed to cool with the oven off and the door ajar for 10 more minutes before being moved to the cooling rack. 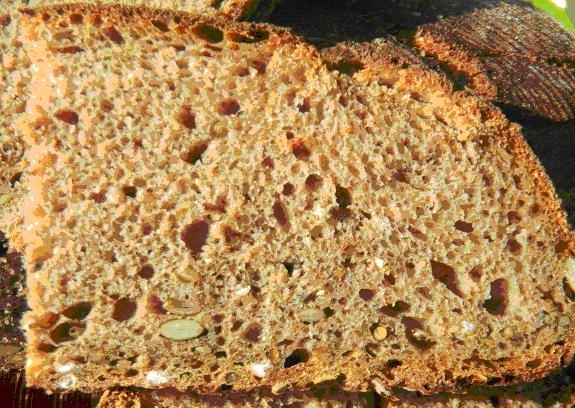 67% Whole Rye and Whole Wheat with Sprouts, Wheat Germ, Flax and Red Rye Malt. that sounds so interesting (like a pipe dream). I can imagine that it tastes very nice. Thanks Hanseata. Am hooked on Hemp. A very handsome , hearty, and healthy loaf, DA! You are hooked now, my friend! I think its the hemp that got me hooked :-) You are right of course - addiction follows quickly and better than beer in that regard. DA....you really are getting that Chacon shape down...this is your best looking one yet. your crust and crumb look spot on! Nice bake. Much better than my hocky puck English Muffins :(. for this one with her Twist Bread she posted a couple of days ago. When I took the photos for this bake, I somehow had the camera set wrong, even though I didn't change it, and all the picture file sizes came out too big for uploading on TFL. So the crumb shots and pre bake shots are not happening. I did get one to save in paint at less then 1 mb and I uploaded that which shows the knot and the braid before the flat disk with the add ins went on. Sorry about your English muffins. Use kjknits recipe next time - they are great! Thanks for your fine comments Ian. What fun would it be if everything came out perfect? Mini Oven!!! Now I probably have Janet mad at me too! I do love my mini oven and may never go back to the big GE. I have one that bakes well also. Bought one for my Sil and she has it at her week-end cabin. Love your twist and the color in your loaf - after baking your loaf looks like a bright, vibrant sun! the way the twists worked for this version of the Chacon - you were the inspiration t0 try them. 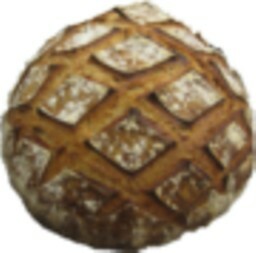 They really do make the bread look like a blazing sun. It tastes pretty good too.